Zap The Ghost by Flavius Ivasca is a free (ad-supported) Android game in which players tap on various spooky characters (ghosts, ghouls, bats, zombies, pumpkins, etc.) 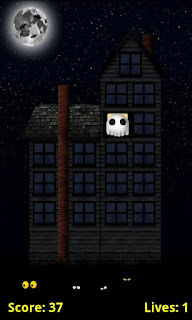 that randomly appear in the windows of a haunted house. By tapping on a spooky character, players gain points, but by tapping on a friendly character (puppies, frogs, kids, etc. ), players lose lives. Miss a spooky, lose a life. Got it? The goal of the game is to gain as many points as possible before running out of lives. This game has two different difficulty levels, easy and hard, and there are leaderboards for each. Zap The Ghost has built-in local leaderboards as well as online global leaderboards powered by Swarm. What's special about Zap The Ghost? The smooth gameplay, chirpy graphics, and delightful use of social features! Flavius did a great job on this one and it's well worth your time to check out. 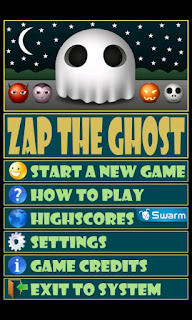 With just 1 month to go until half-halloween, Zap The Ghost could be a great way to celebrate. Cheers!